Started as a family business 75 years, Walt’s serves the towns and villages of the south suburbs with a commitment to low, every-day prices, honest values and friendly service. You’ll see familiar faces in our aisles because most of our family of employees live in the communities we serve. 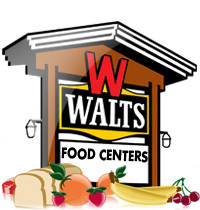 Walt’s is here to provide you with a variety of fresh produce, familiar brand name groceries, a full-service bakery stocked with delicious treats and a full selection of meats and fish.